Then I Got To Thinking...: Dear Andie... You're 5 months old! 5 months! The sweetest, most heart warming months of my life. You have brought me so much joy every day. The highlight of the last month for me has been your noises. You have developed the cutest little giggle, which sometimes turns into a happy scream, and you love when we make faces at you. I can almost always get you to smile when I say "I love you sooooo much!" You talk all the time and I wish I could understand what you're saying. You are quite talented at putting anything in your mouth. Toys, fingers, blankets, anything you can reach goes right into your mouth. You'll even grab my face and try to gnaw on it. One of the cutest things you've started doing is taking your paci out of your mouth and putting it back in by yourself. If we hand it to you, you'll stick it right in your mouth. You are wearing lots of 3 month and 3-6 month sized clothes. Your Gramz loves to buy you clothes and you and your cousin Stella have quite a few matching outfits. You're in size 2 diapers and have managed to blow many of them out. Your little feet are finally growing a little bit and your hands have gotten bigger too! You slept through the night a couple of times this month (even for one long 11 hour stretch, I had to get up twice to make sure you were okay), but you typically go from about 8-9pm to about 4-5am. Bath time is most often with me in the big tub because you love the water. You were splashing and kicking so much in your little tub that we upgrade when we can. You still aren't a fan of the car. Daddy and I have a few tricks up our sleeve (Mickey Mouse Club House and Little Einsteins on the iPad), but sometimes nothing works. We have moved you back into your car seat carrier instead of the big girl car seat because you seem a little more comfortable in it now that you're bigger. I know it's something you'll grow out of. You are very mellow, especially in the mornings. Sometimes, I will lay next to you and you'll just look around and take everything in. I am amazed at how good of a baby you are. You especially love to be held, and at events, you'll let anyone hold you! You are moving and scooting all over the place. We can't leave you on the floor and expect you to stay put - you'll scoot yourself in all directions and roll around to get where you want to go! It amazes me that you're becoming so good at moving around. You tried rice cereal for the first time on October 7th! You did so well and over the last couple nights, you have loved eating it. I think you may be a good eater, just like you are with breastfeeding. This month has made me even more aware of how proud I am to be your mom. When I look into your sweet blue eyes, I am truly overwhelmed with love for you. Sometimes, you and I will just stare at each other. I know I will forever cherish these moments and days with you, so I am doing my best to not take this precious time for granted. When daddy and I take you out in public, you do so well, especially when attached to our chest in the bjorn. You love to see out and talk to people. I love taking you around and introducing you to the world, you've given me a different and special perspective on life. I love you so much and although I am devastated by how quickly time is passing, I know you are growing and developing well and nothing makes me happier. I hope you never doubt how loved you are. she is the cutest!! :) cannot believe she is already 5 months...time seriously flies by. What a cutie!!!!!!!!!!! She is so precious, Tracy! Enjoy these little months...as you know, they fly by. Cameron is now RUNNING through our hose and can show us where his nose and eyes are. What happened to my little babbling baby? Andie is so stinkin precious...I have so enjoyed watching her grow! she is just adorable! Good luck with the whole car seat issue...Elyse went through a phase where she wasn't really a fan either and it was brutal! I cannot believe she is 5 months!!!! Ahhh. She is precious! Goodness that was the fastest 5 months ever! She is gorgeous. What a sweetie. Being a mom only gets better and better. My girl is 16 months and SO MUCH fun! Soak it all in. You are doing a GREAT job! OMG I love her cheeks!!! She's getting so big!! Ugh, I feel for you, we had one that hated the car seat too! What worked for me was downloading a white noise app on my cell and putting that in the car seat turning as loud as it will go. It works. Give it a try and let me know!! She is so stinking cute! Just love her expressions! The jeans kill me! It's too cute! She is so cute!!! 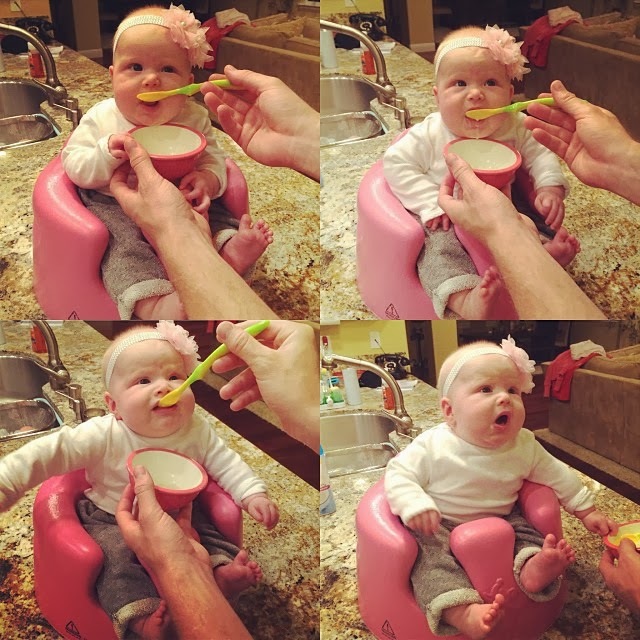 My 5 Month old chunky legs barely fits in her Bumbo! Oh my goodness, she is precious! Love all the expressions! Happy 5 months Andie! She is aaaaaaadorable!! She is adorable !!!! 5 months old already !!! Gosh how time flies. Enjoy every minute ! 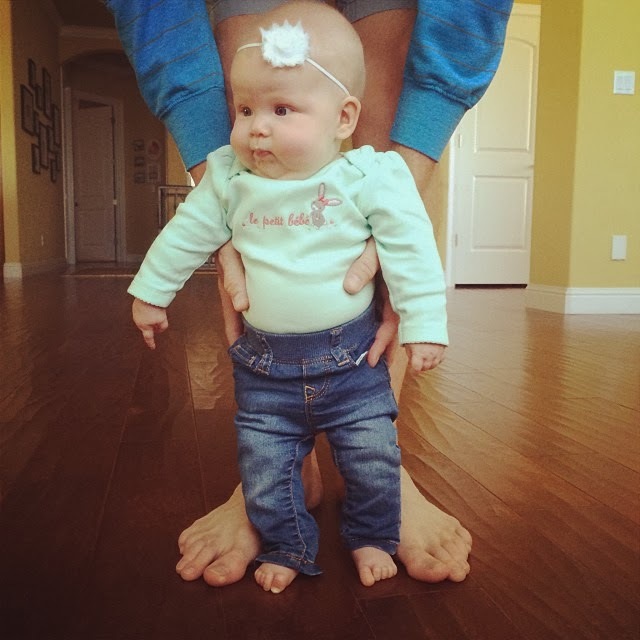 I love her in her little jeans! Awe, she is getting so big! I swear we need a pause button!! How in the world has 5 months already passed?! She just seems like such a happy baby!